Why am I bothering with such a plain, familiar recipe? 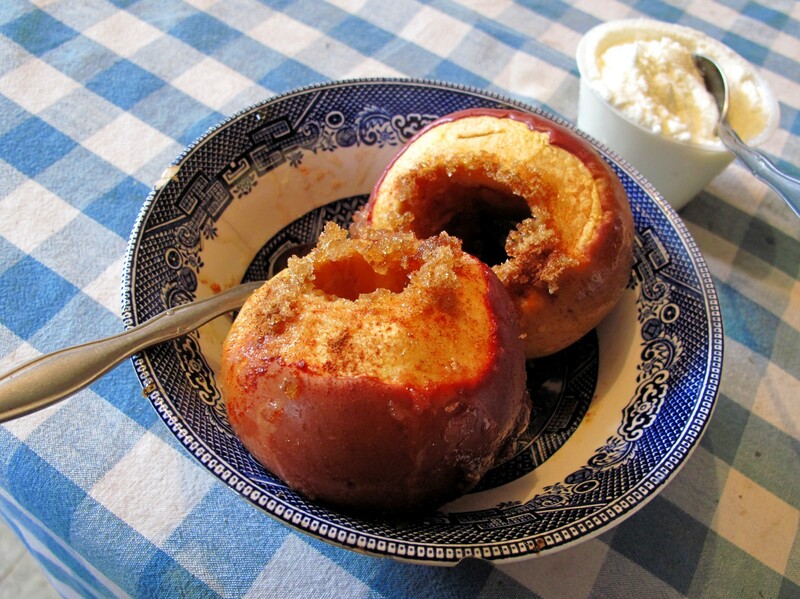 Baked apples are a delicious, neglected and taken for granted dessert. This time of year I get a large box of Black Twig Winesaps from my Market neighbor Dennis, of Backyard Orchard. They keep in the cold room, crisp and sweet thru March or April. If you bake a dozen at a time, then you have instant breakfast or dessert in the fridge all week long. But also to show off the image, that’s why. Last week my photographer (gardener/beekeeper) friend Steve spent a day at Shady Grove, doing barn carpentry, helping cut holiday greenery, and capturing lovely images* of many of my favorite scenes. Because, as the culture dictates, if you work, you eat, that morning I tossed a half dozen apples in the oven, for a warm mid-morning snack. “This was exactly what I needed” was Steve’s comment. My recipe isn’t elaborate or exotic. Just use good solid, tart apples. The key to appeal in many classic dishes is contrast. Too much of anything sweet is satiating and dull. 1. Preheat oven to 325. See how many apples your baking dish will hold. 2. For each apple, measure out 2 tbsp brown sugar. (Yes, yes, if you can get turbinado – or granulated piloncillo – or gur – yaay for you.) Then to each cup of sugar add 1/2 tsp kosher salt. Mix well. 3. Core apples, and peel a half-inch strip around the top opening on each. Place apples just touching in baking dish. 4. Fill cavities with sugar mix. Heap a little on top if there’s enough. Sprinkle a little – very little – cinnamon over each one. Don’t overdo the cinnamon. 5. For every 4 apples, slice a tablespoon of butter into 4 cubes and drop them between all the apples, or between apples and sides of dish. 6. Bake at 325 to suit you. I like them when the skins still look smooth & red, but a fork goes in easily – about 45 minutes in my propane stove. If you like them brown and crinkled, just leave them in another 10 minutes. 7. The butter, sugar and apple juice in the bottom of the dish will have made the most incredible syrup. Spoon some over each apple when serving. When you store the extras, be sure to scrape all the syrup into your Tupperware. Vanilla ice cream would be the obvious topping. Steve and I ate ours with the last of my freezer chevre from milking season. Dojo at Findlay Market makes a Caramel-Sea Salt gelato that’s also great on these.